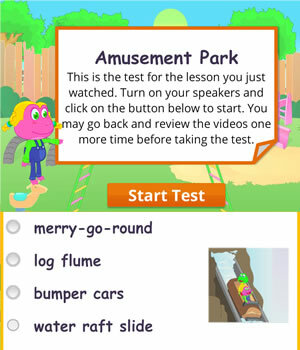 Teach English learners how to talk about their favorite rides in an amusement or theme park. This English lesson also seeks to tacitly introduce EFL/ESL young learners to the concept of a gerund, which is the –ing form of a verb that is used as a noun. Examples include: enjoy riding, like doing. Since it is not often clear when to use a gerund versus the infinitive form of a verb (to ride, to do), it is best to tacitly introduce them within the contexts of different lessons so students form a habit of using them without thinking about the grammar. 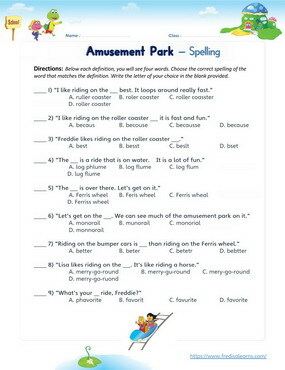 In learning to talk about their favorite rides, ESL/EFL learners also learn to use comparatives and superlatives to express preference. Students will also learn to use the conjunction ‘because’ to give reasons for preference. The worksheets below are useful for offline and classroom activities. 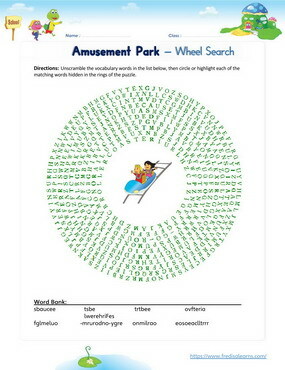 These printable exercises directly correlate with the above lesson 'Amusement Park'. Every worksheet comes with an answer sheet on the second page for educators. Mom, Dad, Freddie and Lisa are out on a fun trip to the amusement park. 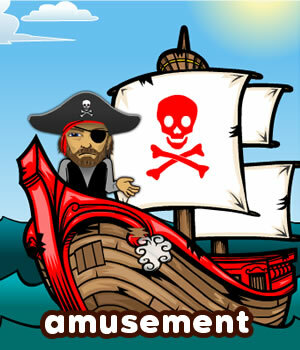 They start with riding on the roller coasters and in the process, express their preference for different amusement rides. The day ends with the family going on a ride aboard the Ferris wheel. What's your favorite ride, Freddie? I like riding on the roller coaster best? Why do you like riding on the roller coaster, Freddie? I like them because they are fast and fun. What other ride do you enjoy? I also enjoy riding on the bumper cars. Riding on bumper cars is good fun. I like riding on the merry-go-round, better. Freddie: I want to go on the roller coasters! 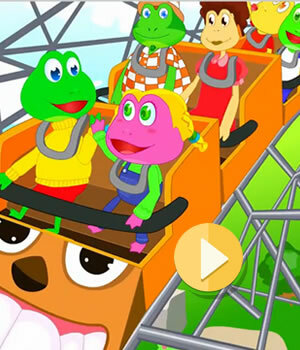 Lisa: Roller coasters are your favorite, I know! Dad: We will go on the roller coasters. Mom: What do you want to do, Lisa? Lisa: I want to go on the Ferris wheel! Mom: We will do that too. Dad: The roller coasters are in the very back, so let’s go there. We will work our way to the Ferris Wheels. Lisa: Wow! Freddie, there are so many roller coasters! Freddie: I know. How will we decide which ones to go on? Dad: Well, some of them are higher than others. And some loop around. Some are faster, too. Lisa: I want the fastest ones! Freddie: Me too. And the looped ones. Can we go on the orange one? Lisa: Can we go on the blue one now? Dad: Sure, Freddie. But then we will go to the Ferris Wheels. Lisa: Which one was your favorite, Freddie? Freddie: I liked the blue one. It had the loops. Lisa: I liked the orange one; it was faster. Dad: I liked both of them. Mom: I think I will like the Ferris wheel more. Lisa: Look! There it is! Freddie: It’s going kind of slow, Lisa. Lisa: I can’t wait to get on it. Freddie: We are next in line. Freddie: That was fun. I like the roller coasters better. Lisa: I liked the Ferris wheel. Dad: Why did you like the Ferris wheel, Lisa? Lisa: I liked to see all of the pretty sights in the park.